The Fellowship was fortunate enough to obtain a copy of HEROES OF THE NORTH: DARK ORIGINS OMNIBUS #1. The stories are written by Yann Brouillette and Michel Brouillette, with art by Marcus Masman Smith and Oliver Raymond, and colors by KT Smith. 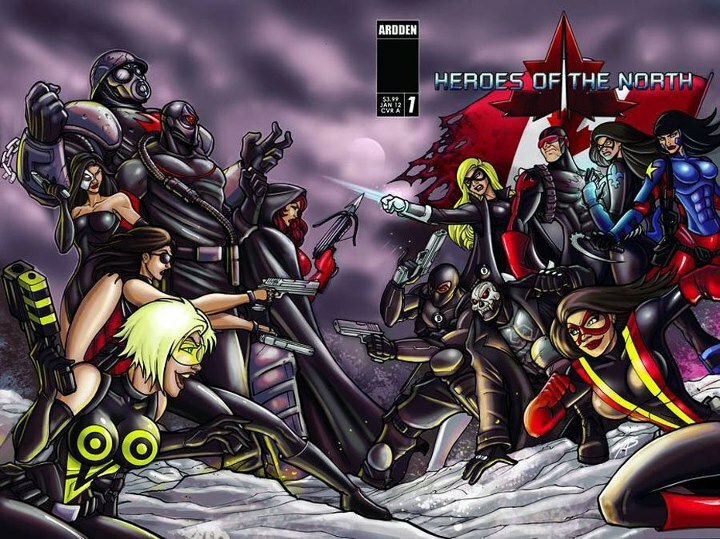 The omnibus collects the origins of the Heroes of the North - a superhero group that is officially sanctioned by the Canadian government. The heroes featured in this omnibus include: Fleur-de-Lys – a heroine with gauntlets that fires electricity; Black Terror - scientist turned killing machine due to nanobot technology; Pacifica – an athlete who is given an uniform that gives her super-speed It also contains the origins of Madame Doom, a ruthless disfigured crime lord (or lady); and Hornet - the Vice President of a weapons manufacturing company who literally kills the competition. These guys mean it when they call this omnibus DARK ORIGINS, not that I'm saying it’s a bad thing. These are interesting characters and would like to see more of them in action – both as a team and in solo adventures. Solid artwork from "Mas" and Raymond. This book is worth checking out.There are webisodes involving the characters at http://heroesofthenorth.com/EPISODES/. HEROES OF THE NORTH: DARK ORIGINS OMNIBUS #1 is available at www.heroesofthenorth.com.